The first shipment of Red Cross humanitarian aid arrived in crisis-wracked Venezuela on Tuesday following approval from President Nicolas Maduro's government, an official told AFP. 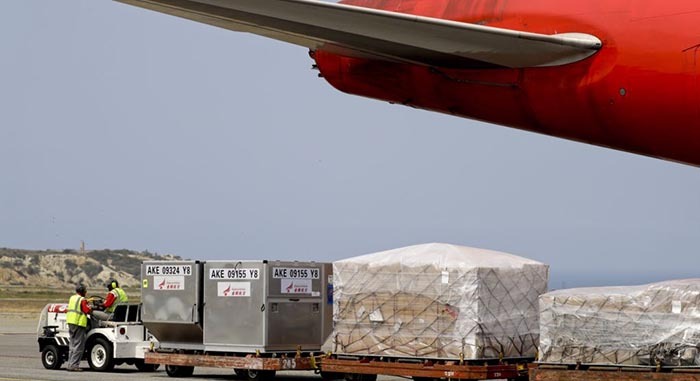 The shipment, which arrived at the airport serving Caracas, includes desperately needed "medication and medical supplies," the official confirmed on condition of anonymity. Venezuela has suffered more than four years of recession marked by shortages of basic necessities such as food and medicine. The United Nations says a quarter of its 30 million population is in urgent need of aid. Supplies destined for Venezuela's long-suffering population formed the basis of a stand-off between Maduro and parliament speaker Juan Guaido, who launched a direct challenge to the president's authority in January. Guaido has since been recognized by more than 50 countries, including the United States, as Venezuela's interim president. But despite a highly publicized campaign, he failed to force humanitarian aid stockpiled over the border in Colombia into the country as the military -- which remains loyal to Maduro -- blockaded a bridge crossing. Maduro claimed the aid was nothing more than a smokescreen to cover a U.S.-led invasion. Maduro has repeatedly denied Venezuela is suffering from a humanitarian crisis and blames the U.S. for the oil-rich South American country's economic woes. But last week he said on national TV and radio that his government and the Red Cross had agreed "to work together with UN agencies to bring into Venezuela all the humanitarian aid that can be brought." Guaido blames government incompetence and corruption for his country's crisis. Last month, the ICRC announced it would begin in early April a first phase of aid distribution to help 650,000 people. The UN estimates that 3.7 million Venezuelans are malnourished and 22 percent of children younger than age five suffer from chronic malnourishment. It also claims that more than 2.7 million citizens have fled Venezuela since 2015.